Wanna learn how to walk into any bank in the country and leave with loads of cash at a low interest rate? Nope, it isn’t robbery. It’s a perfect credit score. A perfect credit score isn’t out of reach. This is a game you can win. And the earlier you start, the easier it gets. Do you have a perfect credit score? If not, you’re not alone—the average credit score across America is 687. That’s certainly a stretch from the shimmering 850 ideal. I actually have a perfect credit score. It wasn’t by luck, and it wasn’t by taking any shortcuts. By understanding how credit worked and enacting a credit strategy tailored to my financial position, I achieved this score and continue to maintain it today. I’m here to tell you that it’s not impossible: a perfect score is achievable over time. I’d like to share my insights—from understanding credit to specific tips—with you. It all starts with a fundamental understanding that credit and debt—credit is the ability to acquire debt, while debt, on the other hand, is the amount owed—are not inherently bad. The word credit may conjure thoughts of being in over your head in debt. But this isn’t always the case, and fear shouldn’t keep you from building your credit (in fact, not utilizing credit is detrimental to your financial future. We’ll discuss this later on). It’s the lack of both financial education and discipline that creates bad, high interest debt. When used properly, credit creates benefits you otherwise wouldn’t have. It allows you to quickly take advantage of good investments and business opportunities. In the event of emergencies, it helps protect you, too. Credit is also useful when investing in yourself. Think about it this way: let’s say you want to attend an educational seminar, but can’t foot the bill. You decide to put the cost on a credit card. As a result of the 3 day seminar, you wind up launching your own micro business and pay back that $500 and the interest, a thousand times over. In a world without credit and debt, we wouldn’t be allowed to enjoy a high standard of living while on a week-long vacation. We also wouldn’t have modern buildings, upgraded office spaces, startups, new cars, and new houses. The list can go on and on. 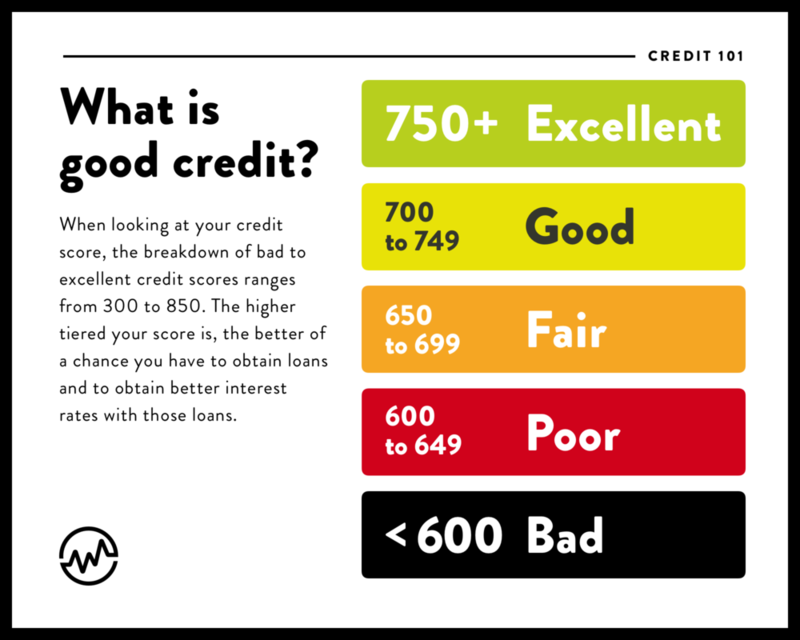 What is Credit, and How is it Scored? Credit gives you the ability obtain goods or services (such as a credit card, an auto loan, or a mortgage) before payment. Credit is trust. Trust that payments will be made in the future. For all of us, credit didn’t begin when we reach a certain age; it begins when we took out our first loan or received our first credit card. Since then, your credit report—a financial report card—has followed you wherever you go. Not only is your report pulled when applying for credit; employers, landlords, government agencies, and insurance companies also give it a peek. Your credit score is based on the information in your credit report. The overall goal of a credit score is to predict behavior. Lenders use these scores to predict the risk of lending you money. Credit scores tied personal identity to financial responsibility. It made every American permanently accountable for their financial decisions. Of course, once everyone had a credit score, we needed credit bureaus to monitor them. Credit bureaus arose and developed algorithms for rating consumer credit scores. A credit utilization ratio (in the chart as “Total Available Credit”) is found by dividing your total credit card balances by your credit limit (or available credit). A general rule of thumb is that lenders like ratios of less than 30%. For example, a credit card with a $10,000 credit line that has $8,000 in used credit would be a 80% credit utilization ratio, which will scare off the majority of lenders. I prefer a 2-3% revolving credit ratio. It shows that you are using it, and using it responsibly. Those who have very low credit utilization ratios typically have high credit scores. 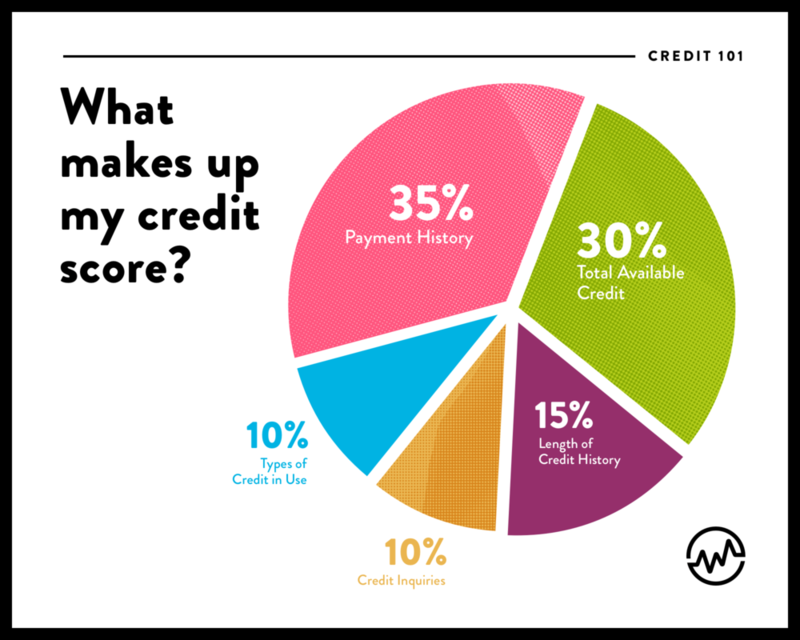 With this chart, it’s easy to see how, for example, even if you pay on time and have a lengthy credit history, a large balance can sink your credit score. Just because you excel at one, two or even three of these factors does not mean it will make up for a poor showing in other categories. 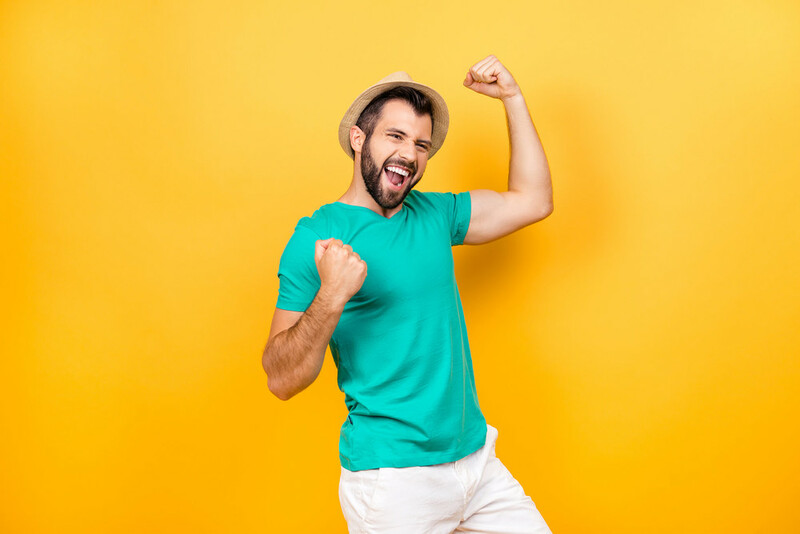 There are several websites that offer a “Free Credit Score.” Ironically, you have to pay for a score from most of these sites, and because each of the 3 credit bureaus grade your score differently, these websites will provide one credit score and try to upsell you to purchase the others. If there’s any advice I can give you about checking your score, it’s to steer clear from the free and scammy sites. For example, you can receive a free credit report once a year from AnnualCreditReport.com. It’s authorized by Federal law. Otherwise, go through the specific credit bureaus to find your credit score, or use trusted sites like Credit Karma. When looking at your credit score, the breakdown of bad to excellent credit scores ranges from 300 to 850. The higher tiered your score is, the better of a chance you have to obtain loans and better interest rates on those loans. 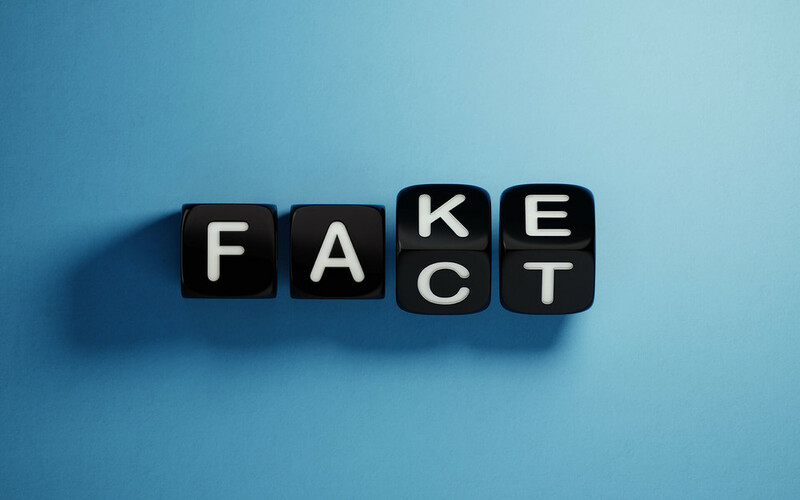 Debunking Credit Myths: True or Misconception? 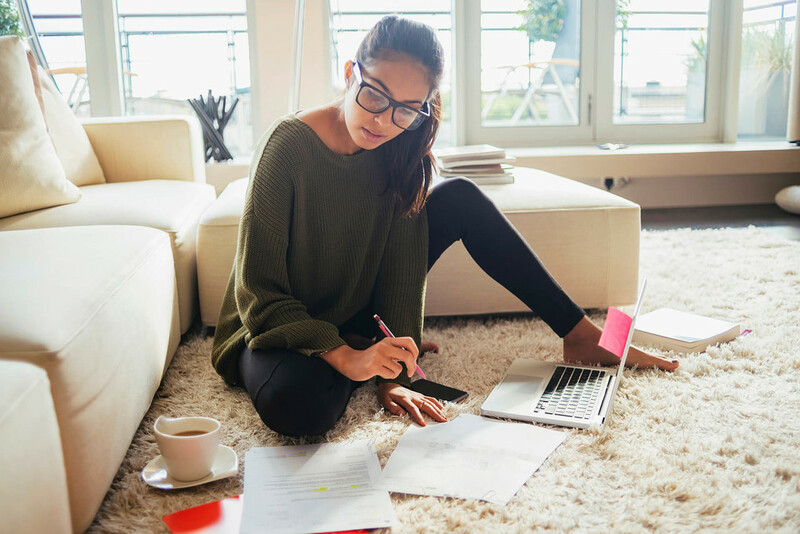 Because there is no guidebook or college course on specific ways to increase your credit score, there are a lot misconceptions that can negatively affect your habits and your credit score. Can you guess which of the following sentiments is a misconception? Myth 1: Credit cards are the best way to improve a credit score. This is a misconception. 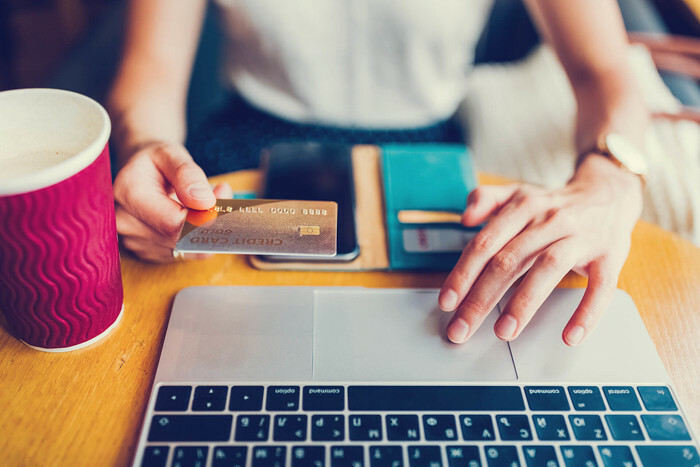 While using and paying off credit cards can indeed improve your credit score, there are several other ways to build and diversify your credit profile. Installment loans or auto loans can actually carry more weight on a credit score. Myth 2: You don’t begin with a perfect credit score. This is true. You start from scratch, and build your score over time. Myth 3: Too many credit inquiries over a short amount of time can hurt your credit substantially. This is a misconception. 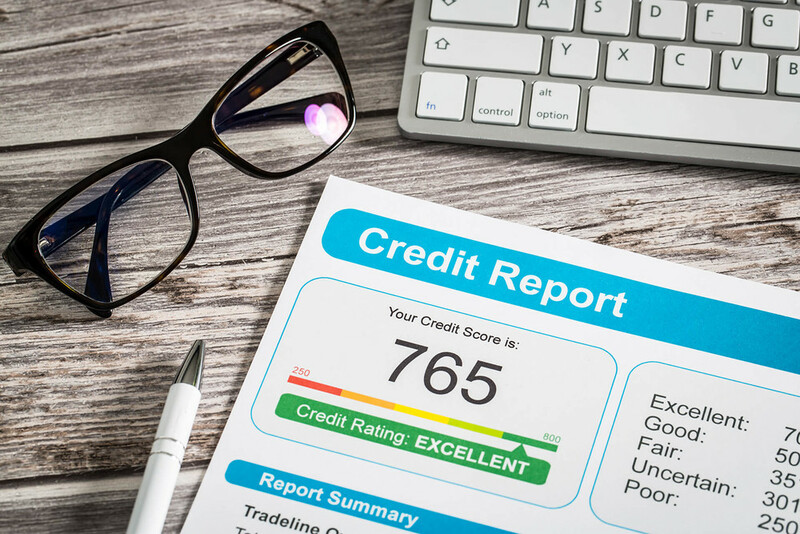 Although too many credit inquiries can lower your credit score, it’s typically only by a few points. For example, if several inquiries from auto dealerships are reported within a short period of time, the credit bureau will know you were shopping for a car. Plus, if you do get dinged, it will be miniscule. Hard inquiries, or when a financial institution looks at your report for a mortgage or credit card, knock only a few points off your credit score. Myth 4: Checking my credit score will lower my score. This is a misconception. Checking your score counts as a soft inquiry, which will not lower it. Myth 5: You need to keep a balance on your credit cards in order to have good credit. This of course isn’t true, because keeping a balance will increase how much you pay in interest. What is accurate is that you need a card to stay active. If you never use credit cards, set it up to automatically pay one or two bills for you per month, such as for cable and electricity. Then set up your bank to pay off the balance automatically each month. This keeps the card active, and it will put positive marks on your credit report each month. Myth 6: If you have a credit card but aren’t using it, close the account. This is a misconception. Because 15% of your credit score depends upon the length of your credit history, closing an account can actually hurt your credit score and your utilization ratio. If you have too many credit card accounts and have no choice but to close one, choose wisely. It’s important to be aware that neither the banks nor the credit bureaus have any incentive to help you reach a higher credit score. Because of this, many have called this not just a scam, but a scam of monumental proportions. Think about it: the lower your credit score is (which is created by the credit bureaus algorithm) the more banks can charge you in interest. The banks, who profit more from a lower score, are the largest customers of the credit bureaus. It’s only natural that the credit bureaus want keep the banks (their largest customers) happy. So in order to raise your credit score and save yourself money on interest, you can’t take general advice from banks. You have to play the credit game. Step 1: Check your credit report. You need to check your credit report before you can improve it. Services like Credit Karma will give you your report for free and detail where you need to improve. Step 2: Make sure your credit reports are void of inaccuracies. Make sure your credit history is correct. If not, dispute it. You are guilty until proven innocent. You won’t be the first person to have an inaccuracy on their credit report. Over 40 million Americans have inaccuracies on their credit reports. Step 3: Create credit roots. Here are some different ways to build credit roots. A) You can do this by obtaining good rewards cards (Visa, MasterCard, American Express, Discover). Put every possible expense on them and pay them off in full every month. Three to 5 cards is a good number to create an established credit profile. B) Also get an affordable installment loan. This builds deeper roots so that your profile isn’t based just on credit cards. Plus, if you’re forced to close an account, having a diversified report (other than just credit cards) will keep your score from lowering dramatically. C) Every 6-12 months, call the credit card company and request a credit line increase. Ask for the moon! For example, ask for a $50,000 line that you’re going to use for investing. If on average my cards had $5,000 on them each, then my goal was to have $100,000 in credit availability. This 5% ratio was still on my credit report even if I paid them off in full each month. If you need to raise your credit score fast, consider piggybacking on someone else's credit history. Check out this roundup of companies who offer tradelines for sale. Do this enough and you'll keep getting increases like I did. Plus, your credit score will do wonders. Step 4: Set up alerts & reminders to avoid late payments. A late payment won’t be reported to credit bureaus unless it’s more than 30 days late, although you will be hit with a late fee. Once reported late, it can stain your credit report for 7 years. Step 5: Pay down bad debt. If you’re struggling to keep your head above water, learn how to get rid of bad debt. The debt snowball method is one strategy to save yourself from financial stress. It’s not the cheapest method, but it uses some powerful psychological tricks. There is no one size fits all strategy, but understanding these principles and enacting them helped me get a perfect credit score. It can do the same for you.